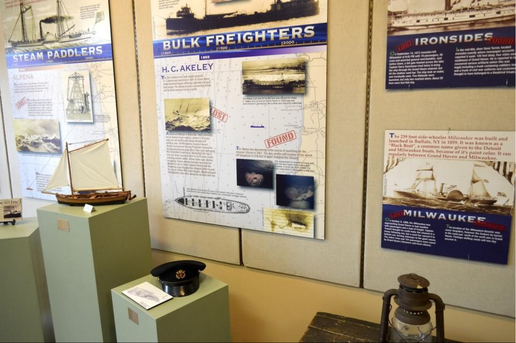 An exhibit detailing historic shipwrecks along West Michigan's coast has resurfaced at the Zeeland Dekker-Huis & Historical Museum. First displayed seven years ago, the show has been mothballed since, according to museum curator and manager Suzy Frederick. Since a portion of the show was remounted just two weeks ago, the museum has seen visitors from around Zeeland as well as a few distant tourists who stopped by — from as far away as the Netherlands and Bulgaria. Visitors are delighted by the miniature sailing ships and other artifacts being used as part of the display, Frederick said. "Lost & Found: Shipwrecks of West Michigan" is the work of historian and hall-of-fame diver Valerie Van Heest, of Holland. She created panels showcasing images and stories about various ships lost in Lake Michigan and details on each one, such as the Ironsides, lost in 1873 or the Milwaukee, lost in 1868. Other panels include photos from diving expeditions to document underwater wrecks. "West Michigan is a wonderful place for recreational divers," Frederick said, adding that the show is expected to draw history buffs, families and diving hobbyists, among others. What she's really hoping for is that someone who sees the show will want to buy the panels, which originally cost the museum "thousands of dollars," she said, or at least rent the exhibit. West Michigan has about 90 museums that could be interested in the show, and some school districts as well. Renting or selling the show, Frederick said, would infuse much-need cash into the museum's coffers, though she declined to disclose rates, saying that would be negotiated individually. Frederick said she would like to see more people embrace the museum, which has operated purely on donations from patrons, boosters, volunteers and sponsors. Zeeland Historical Society operates the museum, coordinating needs with 26 volunteers willing to do light maintenance or supervise the museum during visiting hours as well as guiding visitors. In recent years, volunteers have documented thousands of artifacts, linking photos to a searchable database of terms — a huge leap in efficiency for planning exhibits as well as key aid for people who use the museum to conduct various types of research.